Treyarch is teasing a new-look version of Nuketown ahead of the release of Call of Duty: Black Ops 4 later this week. The developer tweeted a photo last night suggesting that one of Black Ops’ most iconic maps will be heading to Russia after the game launches. The tweet, which you can check out towards the bottom of this article, comes with a message in Russian. 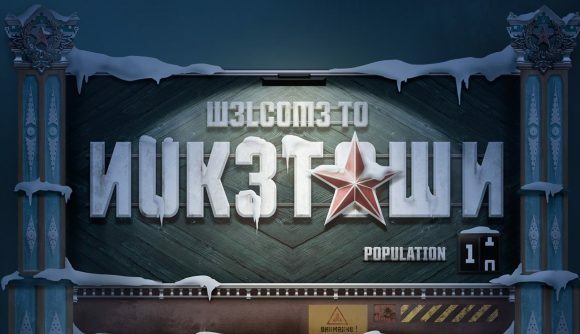 When translated, it reads “Visit us again…for the first time here #Nuketown.” The message is the caption for an image of a sign that says “Welcome to Nuketown” in Treyarch’s slightly tongue-in-cheek version of Russian. Elsewhere on that sign, there’s a population counter that’s ticking up from ten to 11, and what looks like a radiation warning towards the bottom of the image. What’s important to note, however, is that the entire image is covered in a thick layer of snow. If it wasn’t already clear, it looks like Treyarch’s tease is saying that Black Ops 4’s version of Nuketown will be revamped with a new, Russian setting. Nuketown has previously been remade on three occasions. The small-scale map, which is based on the USA’s nuclear-testing sites, first appeared in the original Black Ops. New versions appeared in both Black Ops II and III, but this will be the first version of the map that will not be set in the USA. We already knew that Nuketown was coming to Black Ops 4 as a post-release map, but not that the setting would be changed so significantly. Our COD expert, Jordan, tells me that the map will likely make its way to the game later this year. The Call of Duty: Black Ops 4 release date is now just around the corner – you’ll get to play the game from October 12, so you’ve only a couple of days to wait until you can start pulling off those 360 no-scopes. That’s still what the cool kids are doing, right?